The Thai House is found on Guildford Crescent in Cardiff City Centre and is recognisable by the blue painted exterior.I went with a friend after work on a miserable wet and cold Friday night. We were looking for some warmth; hey ho we found it.Greeted by smiles we took off our wet coats and were seated on a smartly laid table. The restaurant itself was spacious, classy with low lighting and mellow background music. Looking at the menu the options were wide-ranging but also pricey so we focused on the set menus this meant we could taste a sample of everything.We ordered the Krungthep set meal for two, which was £22 each. Although this seems expensive the amount served and the quality of the food was worth the price. The menu came with two courses that were packed full of gusto dishes. The starters were tastefully presented in the centre of the table so we could pick and chose which ones we wanted to try. The Sate’ was tender slivers of chicken marinated in a special sauce and came with a sate dipping sauce. This was scrumptious. The sate was rich with a buttery texture while the chicken had a smoky edge to it. I wanted more! Another starter was the Kanom Jeep, which is Thai styled dumplings with minced pork, prawns, water chestnuts and mushrooms. These were steamed and served with soy sauce. I always prefer steamed dumplings but I wasn’t too keen on the filling of these. The meat was peppery and tasted like an underdone sausage, which overpowered the prawns and other fillings. The Kanom Bang Na Hed was my favourite starter! This is seasoned Thai mushrooms on toast that is deep-fried and served with cucumber relish. It was glorious. Crispy and crunchy batter sealed in the sweet mushrooms. The cucumber relish was also lovely and complemented it well. That was a just starter soon after we finished our main meal was served. The main course was 3 dishes served with Thai style rice. The dishes all looked marvellous and the aromas from the dishes were enticing. The first dish I tried was the Gung Pat Prik, which was king prawns lightly cooked with Thai herbs, chillies and red peppers. 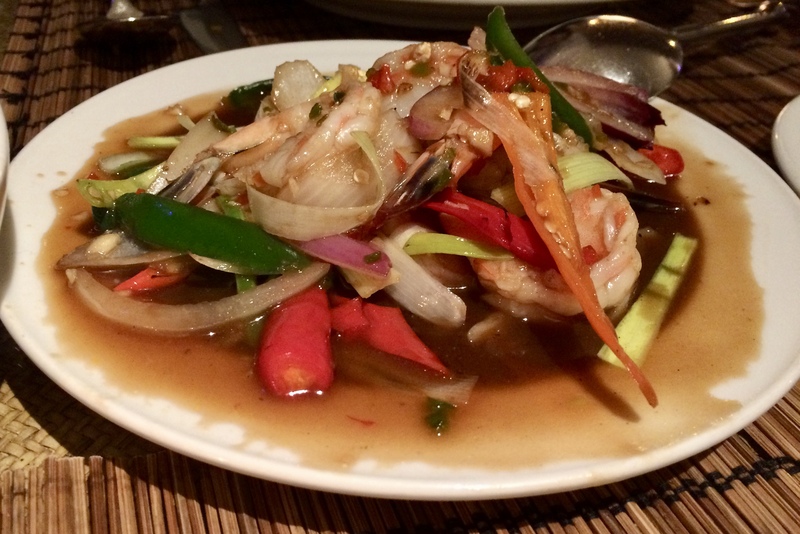 The prawns were meaty and had absorbed all of the Thai herbs unleashing a mouthful of heat and gusto. The vegetables added sweetness, which magnified the heat of the chillies. The second dish I tasted was the Gang Kio Warn Gai, which is a hot green chicken curry with aubergine and fresh basil. This was a considerable portion, my one complaint is that there was more sauce then there was chicken or aubergine so the curry was quite runny. The chicken was thinly sliced which may have been the problem. However, the chicken was tasty and like the sate had smokiness to it. The aubergines were chunky but soft and watery. They had taken in the coconut and coriander flavours of the sauce. Although this curry was hot to begin with my mouth soon calmed down and all the other delectable flavours could be tasted. I do recommend having water for the table if you are not partial to hot food. The final dish was Pat Pak Namman Hoi, which was a selection of fresh green vegetables in oyster sauce. This was luscious! Like the other vegetables the greens had soaked up the oyster sauce and heat from chillies but were crunchy and crisp. The oyster sauce was another flavour to add to the meal and overall the vegetables were a good side to the other dishes. The meal was very filling, which was unfortunate, as we couldn’t sample any of the attractive deserts. My friend and I really enjoyed all of the dishes we tried and found the meal overall impressive. I find it hard to find much fault in the food the Thai house served and the service overall. It was at a very high standard and I would recommend it to anyone. What I will say is that the heat of the meals is not for the faint hearted! Next Ladies Lunch at the Orchard.